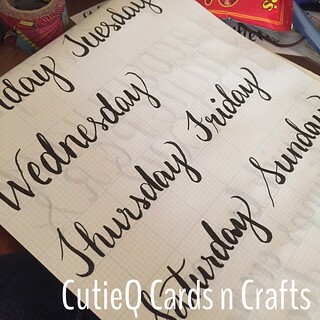 CutieQ Cards n Crafts – Brushlettering | Living life in the carpool lane.. 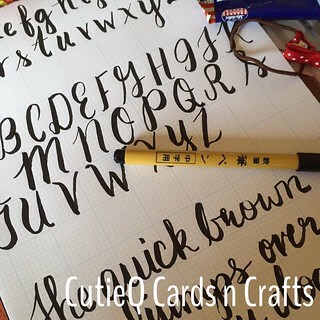 I love watching those little Instagram videos of all those people that can do brushlettering so well. I only wish I can be as talented as all those people. One thing they always emphasize when people ask them how they do it is “practice.” They practice all the time. They are always writing, they are always honing their craft. I was lucky enough to find a very inexpensive ($1.99) brush pen at a small Japanese shop inside of a mall we visited last weekend. Needless to say, I was very excited and you can see the video where I show the pen and my first impressions here (don’t forget to ‘like’ the page too!). I’m very much in love with the pen and I love practicing whenever I get a free moment. I’ve been starting off with the alphabet and some simple sentences. Random fact: I spent an entire summer writing down “The quick brown fox jumps over the lazy dog” until my mom approved of my writing. I guess I can credit her when people compliment my penmanship. I actually enjoy writing with that brush pen. I’m still getting used to manipulating the strokes and remember when to do thick and thin lines. It’s definitely a process and practice really does help make things easier. I’m also trying to string the letters together and form words. It’s a very different feeling with the pen to form words than just drawing letters. Every day gets a little easier. Figuring out how to hold the brush pen and how to move the brush pen is getting a little easier. And I know that as I continue to practice, I will eventually develop my own style and flair to the brushlettering. It just takes a little time. I can’t wait to look back at these old writings and see how much my style has changed and improved (I hope!). I do plan on participating in some Instagram lettering challenges next month. Any recommendations?